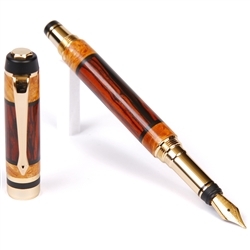 Each of Lanier's fountain pens is truly one of those sought-after writing instruments by users and collectors alike. When a graduate is given a Lanier fountain pen, they know it's something special to cherish the rest of their life. Our ink pens are handmade out of an exotic wood from around the world, and trimmed in one of many plating techniques that add to the wood fountain pen's beauty and durability. Each handmade wood pen features a German-made high quality medium size Iridum nib with broad and fine tips nibs available. If you're looking for the right pen to use as your daily writing instrument, or another 'piece of art' to add to your ink pen collection, you can choose from Lanier's exquisite Fountain Pens. 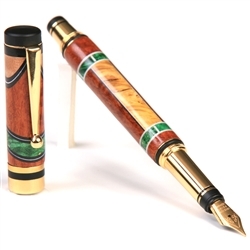 After selecting what fountain pen style you want, you then can choose from one of the more-than sixty non endangered hardwoods species from around the world including Australia, Asia, Africa, the frontier forests of the United States and other locations. 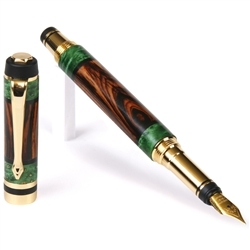 You can also choose the plating option that helps add to your pen's beauty, and allows it to make its own statement. Plating options to use on the nib funnel, cap and clip include 24kt Gold, Brushed Satin, Black Enamel, Titanium Nitride, Rhodium and Black Titanium. Lanier's Fountain Pens accept universal size Private Reverse Sealed Ink Cartridges which are available in black, blue and many other ink formulations.